← Another Baptist Fan Quilt! It has been a great weekend here so far. After church, I may be taking a road trip with Daughter #3 for some shopping. So that meant casting about for a hand project. I pulled out this oldie that I haven’t worked on in ages. I think scrap quilts will always be my favorites. I would be happy to just get that partial row finished. Right now, this is about 48 by 56 inches or so. I’m not sure how big I want this to be. 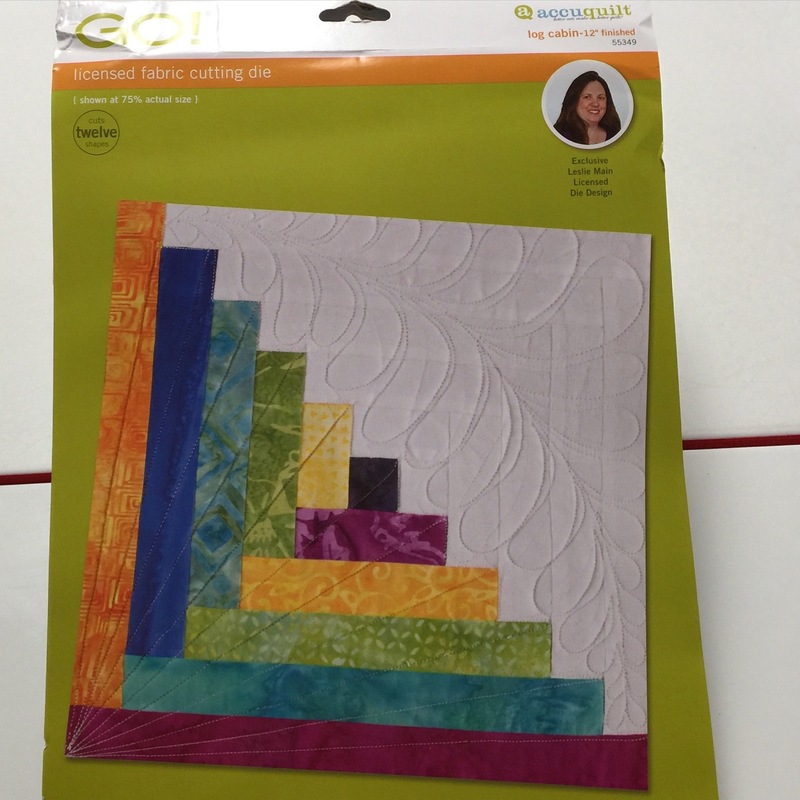 I joined a Facebook group for people buying and selling Accuquilt dies etc. Its called Accuquilt Sales. Someone posted a note that this die was on clearance online and they got it price matched in the store. I know, I know, I said no more log cabins for me. But this is not paper piecing and the cutting will be a breeze. The logs finish at an inch wide. I stopped at a little antique shop last week and found this vintage pants hanger. It’s perfect for hanging my little quilts. Now to find a place to hang the hanger. I haven’t done any piecing in over a week and I’m looking forward to doing some this week. 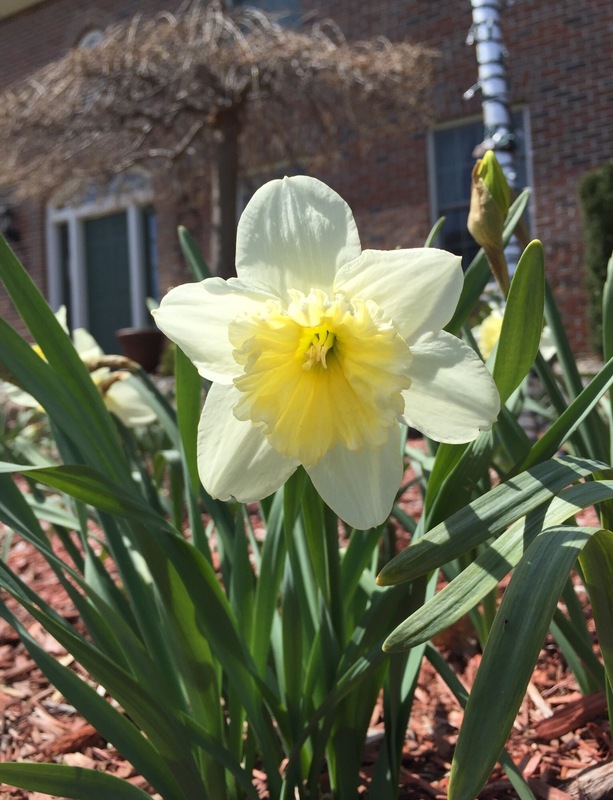 But first, I’m going to take some time to smell the daffodils. Beautiful flower and hopefully you had a wonderful road trip with some stitching. Love your hexi progress! Do you prefer glue or thread basting? Enjoy your road trip! What a great way to spend a Sunday. 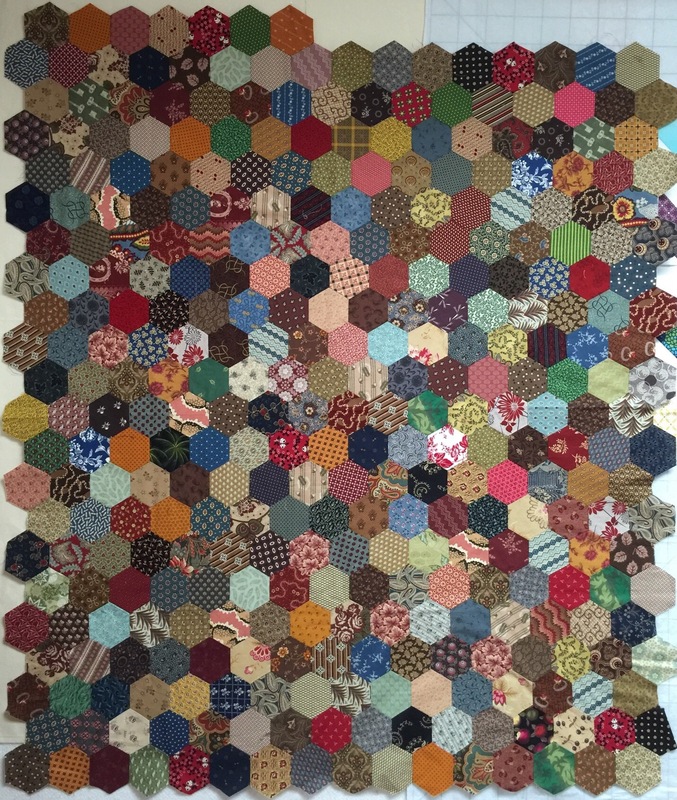 Thanks for sharing your lovely hexagon quilt with Oh Scrap! And I say, get the die. I love sewing log cabins, it is all that cutting that I don’t enjoy. I’ve had the log cabin dies on my wish list for the longest time. Perhaps if they’re on clearance, I’ll bite the bullet and make the purchase. I love that little pants hanger turned quilt hanger … cute! Enjoy your drive. It’s going to be nice here today … I think I’ll sit out on the deck with some hand stitching. I love how you used the antique pant hanger. Enjoy your shopping road trip and the opportunity to work on your hexies. The pants hangar for your minis is such a great idea! Enjoy your hexi-sewing road trip today! 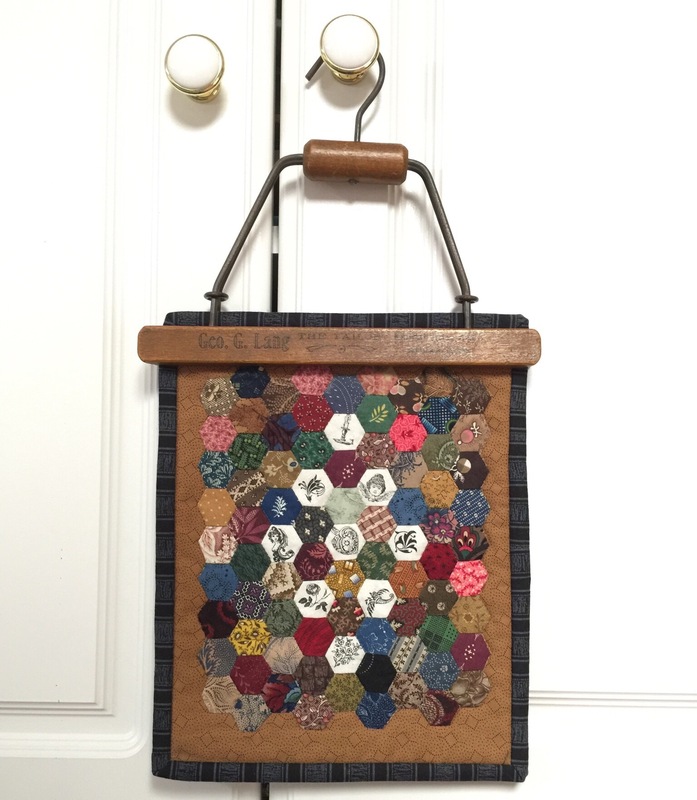 I love the vintage pant hanger…so perfect for small quilts! Your hexies are just amazing…a labor of love! The pants hanger is a great find! Love that mini quilt hanger – such a great idea and to be so lucky to find one! What a wonderful scrappy project! Just perfect for some road trip stitching!